The origin, it's the center of the workplane. In this case the green square between the 2 circles. By selecting 2 points, I think SolveSpace can deduce it's a line so we can apply the horizontal constrain on it. So we begin by selecting the two circles, and choosing Sketch → Split Curves at Intersection. Uh. It's strange! Maybe you selected one more entities than just the two circles? 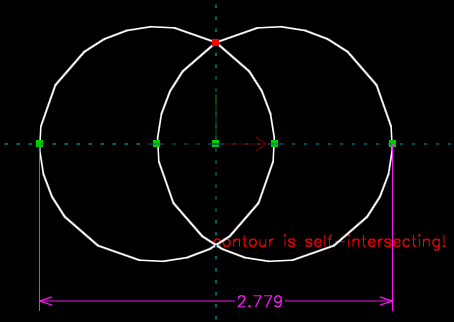 Because like the sketch says, "contour is self-intersecting" so the solver may work. It looks like splitting works for you at 00:10. At 00:23, you have selected a point, not two curves. Take a look at the text below that picture in the tutorial; it's an illustration of what happens after the first split, not instructions on how to make the second split. Next, remove the size, and then: Please tell me what to do with pink figures and what they mean. They are located next to the green square icons (see video). The magenta squares are "horizontal" constraints. If you select them (or any other constraint), then you'll see a brief description in the browser window. If I do not delete them, you can continue to explore further the lesson? Or they should be removed? The constraint will be automatically deleted if you follow the instructions in the tutorial, when you split the circles into arcs.